This first edition of our Baseline Scenario makes three main points. First, we are facing a serious crisis of confidence in much of the world’s financial system. Second, the Paulson Plan may well bring this crisis under control, at least for a while. But, even so, we should plan ahead for measures to deal directly with the deeper underlying problems of bank capital and restructuring mortages. Third, if as we expect, further serious measures are needed (particularly bank recapitalization and dealing with the underlying mortgage problems), these are entirely feasible and well within the resources available to the US government. Governments in Western Europe and some other countries also need to act, and they also have more than sufficient resources at their disposal; however, we remain worried that some of these governments do not yet understand the gravity of the situation. Update: to be clear, our plan for pulling the global financial system out of its nose dive is at the end of the document; feel free to skip straight to that and then work your way backwards to see our reasoning. Update: the next edition will appear by 9am Monday morning, October 6. Editor’s Note: The original version of this document was a separate page with a link from the short blog post above. I have since consolidated the long document into this blog post. It follows after the jump. In order to figure out how to combat the current economic crisis, it is important to understand what kind of crisis we are dealing with. The conventional wisdom is that we are dealing with a housing crisis (falling housing prices) magnified by excessive leverage. But this puts the emphasis in the wrong place, and fails to grasp the key dynamics of the crisis. This is much more than a housing crisis………. Problems in the U.S. housing market triggered a global crisis of confidence in global financial institutions, but the housing problems themselves were not big enough to generate the current financial collapse. America’s housing stock, at its peak, was estimated to be worth $23 trillion. A 25% decline in the value of housing would generate a paper loss of $5.75 trillion – similar to the losses observed in the 2000-2002 decline in stock prices, and not far off the losses as a share of GDP due to the 1987 stock market crash. With an estimated 1-3% of housing wealth gains going into consumption, this could generate a $60-180 billion long term reduction in total consumption – a modest amount compared to US GDP of $15 trillion. The resulting decline in the US dollar, which boosts exports, and the offsetting fiscal stimulus, would probably have reduced the overall shock by at least half. We should have seen a serious impact on consumption, but, there was no reason to a priori believe we were embarking on a crisis of the current scale or entering a deep recession. But, conventional wisdom continues, this fall in housing prices was magnified by leverage, causing financial institutions to collapse. But this is also not a compelling argument. First, what does it mean to be too leveraged? Economic theory provides no concrete answer, because it depends on the way you use leverage, and on the other tools available to mitigate risk. The range of leverage at institutions varies enormously: typical commercial banks have assets which are 10-12 times their equity, while some investment banks recently had assets that were 30 times their equity. However, investment banks offer loans secured against underlying, liquid securities, making those loans more “secure” than typical commercial bank loans. The growth of credit in the economy, relative to the size of incomes, has been large over the last 50 years. A graph of broad credit or money as a percent of GDP shows steady growth in the US during this period, and it is hard to know when exactly the US had “too much” credit. Credit can grow for many reasons: a fundamental rise in consumer debt; a multiplying process where we hold time deposits while running a balance on our credit cards; an increase in leasing; or an aging of the population, which produces increases in pension funds and other savings vehicles. Even if we assume that credit was overextended, today’s crisis was not a foregone conclusion. There are two possible paths to resolution for an excess of credit. The first is an orderly reduction in credit through decisions by institutions and individuals to reduce borrowing, cut lending, and raise underlying capital. This can occur without much harm to the economy over many years. The second path is more dangerous. If creditors make abrupt decisions to withdraw funds, borrowers will be forced to scramble to raise funds, leading to major, abrupt changes in liquidity and asset prices. As we discuss below, these credit panics (i.e., fear that assets may fall in value) can be ex-post vindicated by the loss in value that occurs during bankruptcy, conservatorship and liquidations. Worries about declining asset values can be self-fulfilling. So leverage itself did not cause the crisis we observe today. There was no magic threshold that was passed in 2007 and that Mr. Greenspan or Mr. Bernanke should have been aware of. Today, however, we can see how leverage can be calamitous: all leveraged financial systems, regardless of the level of leverage, have the ability to collapse far more sharply than prior fundamentals would deem plausible. Understanding this is key to understanding the solution. We have seen a similar crisis at least once in recent times: the crisis that hit emerging markets from Thailand to Korea to Russia to Brazil in 1997 and 1998. For countries then, read banks (or markets) today. In both sets of cases, a crisis of confidence among short-term creditors causes them to pull out their money, leaving institutions with illiquid long-term assets in the lurch. From there, the contagion spread for no apparent reason. South Korea – which had little exposure to Southeast Asian currencies, and even participated in the IMF bailout of Thailand – came under suspicion in October 1997; investors ran, the currency collapsed, and creditors suffered bankruptcies and major losses. Russia was next. At the time, Russia was emerging from recession with growth recovering and improved political stability, and had little exposure to Asia. However, Russia was funding deficits through short-term rouble bonds, many of which were held by foreign investors. Although the real economy was improving, short-term creditors panicked, and the best efforts of the government and the IMF could not prevent a devaluation (and a default on those rouble bonds). GDP fell 10% the following year, and creditors suffered in one of the largest single national defaults in history. With Russia out, nervous creditors turned to Brazil, where the story repeated itself, although, again, Brazil had little exposure to Asia or Russia. In December 1998 Brazil let the currency float, leading to a sharp depreciation within one month. In each case, creditors lost confidence that they could get their principal back and rushed to get out at the same time. In such an environment, leverage is not a necessary ingredient for a financial collapse; any institution that borrows short and lends long is vulnerable to such an attack. Sometimes the fears were driven by fundamental factors; for example, it is reasonable to think that Malaysia would be affected by a devaluation in Thailand. However, the contagion often spread despite little real economic links. The victims had one common trait: if credit were cut off they would be unable to find funding. The decision of credit markets became self-fulfilling, and policy makers around the world seemed incapable of stopping these waves. In this context, the evolution of America’s crisis seems remarkably similar to the emerging markets crisis of a decade ago. Let’s look at how markets have been impacted by key events. America’s crisis started with creditors fleeing from sub-prime debt in summer 2007, although already in 2006 there were signs the market was failing. Rapidly rising default rates made clear these were poor investments. Investment-grade debt – often collateralized debt obligations (CDOs) built out of sub-prime debt – faced large losses. The exodus of creditors caused mortgage finance and home building to collapse. The second stage began with the Bear Stearns crisis in March 2008 and extended through the bailout of Fannie Mae and Freddie Mac. As investment banks evolved into proprietary trading houses with large blocks of illiquid securities on their books, they became dependent on the ability to roll over their short-term loans, regardless of the quality of their assets. In other words, they became like emerging market economies in 1997. And in a matter of days, despite no major news, Bear Stearns was dead. However, while the Federal Reserve and Treasury made sure that Bear Stearns equity holders were penalized, they also made sure that creditors were made whole – a pattern they would follow with Fannie and Freddie. In effect, the government sent the message that creditors could safely keep their counterparty risk with large financial institutions – implicitly encouraging banks to continue lending to each other. But until they were bailed out, creditors lived through a nightmare in the last days of Bear Stearns: credit default swap spreads shot up, bonds fell, and fears grew that liquidation would occur. Even though they eventually made their money back, bond investors dislike volatility, and the event opened the door to further speculative attacks. The third stage, beginning two weeks ago with the failure of Lehman and the “rescue” of AIG, marked a dramatic and damaging reversal of policy – something which is underappreciated in Washington today. Once Bear Stearns had fallen, it was natural that investors would focus on Lehman; and again, as confidence faded away, Lehman’s stock fell (from $15.17 to $4.22 from September 4 to September 11) and its ability to borrow money evaporated. The difference this time was that the Fed let Lehman go bankrupt, effectively wiping out creditors (senior debt fell to less than 20 cents on the dollar), which is exactly what some bondholders had feared. AIG was a less obvious candidate for a liquidity run. Despite large exposure to mortgage-backed securities through credit-default swaps, no analysts seemed to think its solvency was truly in question. This all changed in September – again, not because of any fundamental changes, but simply because the markets decided that AIG might be at risk. AIG’s collapse began just as Lehman went under, but AIG’s financial exposure to Lehman was not an issue. And as with Lehman, Treasury and the Fed sent the message that creditors would not be protected. The loan was not only granted at the usurious rate of LIBOR plus 850 basis points but secured by AIG’s most valuable assets, leaving senior debt trading at a 40% loss. This decisive change in policy probably reflects a growing political movement in Washington to protect taxpayer funds after the Fannie Mae and Freddie Mac actions and the headlines that U.S. taxpayers were now taking on $6 trillion of debt. In any case, though, the implications for creditors and bond investors are clear: RUN from all entities that might fail. Even organizations that are too big to fail, even if they appear solvent apart from the liquidity crisis, are no longer safe. As in the emerging markets crisis of a decade ago, anyone who needs access to the credit markets to survive might lose access at any time, and hence might fail. The next targets were obvious: the previously invincible Morgan Stanley and Goldman Sachs, each with $1 trillion balance sheets and respectively an assets-equity ratio of 24 and 30 (from second quarter data), saw large jumps in their credit default swap rates. Citibank, with its $2 trillion balance sheet, also experienced a major fall in its share price. 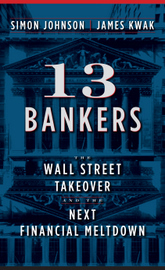 As a result, creditors and uninsured depositors at all risky institutions are finding means to pull their funds – shifting uninsured bank deposits to Treasuries, moving prime brokerage accounts to the safest institutions (read JPMorgan), and cashing out of securities arranged with any risky institutions. The sudden rise of LIBOR rates (for interbank lending) matched by a fall in short-term US Treasury rates illustrates the shift of funds from banks to Treasuries. These sudden changes in liquidity invariably lead to stress: the collapse of one money market fund, and the pending collapse of more, sent the U.S. Treasury into crisis mode, again. And like a decade ago, the credit market shock waves are now travelling throughout the world. In the UK, interbank loan rates approached 8-year highs in the two weeks after the Lehman bankruptcy, and Bradford & Bingley is being nationalized; in Europe, EURIBOR rates also shot up and Fortis is being choked by lack of access to credit (as we write a large capital injection, around 11bn euros, from Belgium, the Netherlands and Luxembourg has been announced). Further afield, Russia and Brazil each saw major disruptions in their interbank markets over the past two weeks, and Hong Kong has experienced a (small) bank run. There is no doubt the genie is now out of the bottle. There is general fear around the world that any leveraged institution might fail. The view is: We don’t need to know anything about capital, or solvency, just whether the company can survive if short term credit is cut off or borrowing rates sharply rise. JPMorgan obviously thought Bear Stearns was not insolvent when they paid $10 per share in the fire sale; Lehman fell when it still had a reported book value per share of $27.29; and the fall of AIG seems clearly due to a liquidity run. The problem is simple: there are just too few entities with a large enough balance sheet to stop liquidity runs. Once a liquidity run succeeds, liquidation destroys a large portion of the value, and creditors lose out. Self-fulfilling collapses can dominate credit markets during these periods of extreme lack of confidence. There is a second ominous aspect of these collapses. When companies fall, the survivors benefit. JPMorgan has now obtained Bear Stearns and Washington Mutual at fire sale prices. Bank of America hauled in Merrill Lynch. Barclays and Nomura have divided Lehman’s assets. Warren Buffett is presumably hoping to profit from the difficulties that have beset Goldman Sachs. Mitsubishi-UFG is hoping to benefit from the situation at Morgan Stanley. Many others are poring over the books of Wachovia Bank. While the conventional wisdom views this as healthy, in reality this is a cost of extreme lack of trust in credit markets. The acquirers have an incentive to wait, let a company fall, and then scoop up the assets. Treasury and the Fed are each time relieved that someone can “come to the rescue”. America’s financial system is quickly becoming dominated by a few players who will naturally strategize to get assets as cheaply as they can. This is standard market behaviour, without any collusion or conspiracy, but quite far from generating efficient market pricing. In this context, there are two critical questions. First, what happens next? And second, what can we do about it? The events of the last few months could be setting the stage for a major global recession. In the face of uncertainty and higher credit costs, many spending and investment decisions will be put on hold. We will surely see US and European consumption decline along with housing prices. With credit default swap rates and interest rates rising around the world, companies will prefer to pay down debt and reduce spending and investment plans. State and municipal governments will see lower tax revenues and so cut spending. In the United States, we can no longer rely on exports to provide much cushion, as growth and spending around the world have been affected by the flight from credit. There are really two ways to end a crisis in confidence in credit markets. The first is to let events unfold until so much deleveraging and so many defaults have occurred that entities no longer rely on external finance. The economy then effectively operates in a “financially autonomous” manner in which non-financial firms do not need credit. This is the path most emerging markets took in 1997-1998. Shunned by the world investment community, it took many years for credit markets to regenerate confidence in their worthiness as counterparties. Today, the U.S. is still far from such a scenario. The Paulson plan can be seen as an attempt at this second route. On its own, however, it is probably not enough to be decisive. $700bn, provided in two tranches, is a relatively small fraction of the amounts in question. Morgan Stanley and Goldman Sachs each have $1 trillion of assets on their balance sheets; Citigroup has over $2 trillion; and non-U.S. banks are largely unaffected by the plan. The announcement that the Fed will pay interest on reserves will help a little, at the margin. But the small size of reserves, relative to bank assets, suggests that this will not do much to deal with the larger problem. The latest version of the Paulson plan also leaves a few major issues unclear. Financial institutions will benefit from the ability to sell mortgage backed securities, if the price is high enough, but most commercial banks keep mortgages on their books at prices near to par, and might be unable to sell. Many banks hold large quantities of whole (unsecuritized) mortgages, which would be difficult to auction or sell in bulk to the government in any case. And finally, the plan depends on the willingness of Treasury to pay enough to bail out the seller, which may be more than the securities are worth. However, the strength of the plan is that it clearly demonstrates that the U.S. government is prepared to use its balance sheet to end the crisis. This signal may be enough to settle the credit markets. However, it would be a mistake to assume that the worst is behind us. The most important thing to do now is prepare for the next stage – continued speculative attacks on leveraged institutions in the U.S. and around the world, against the backdrop of a stagnating world economy. Additional decisive, well-timed measures may well be needed to restore confidence, and these should be thought out and prepared in advance. In essence, we need a Plan B, even if it never becomes necessary to use it. The United States’ main strength is that the U.S. balance sheet is credible. The U.S. is not going to lose its AAA rating. Because all U.S. debt is in U.S. dollars, there is no danger that exchange rate depreciation will magnify debt burdens as occurred in emerging markets. The U.S. balance sheet cannot save everyone in the world, but if necessary it can be used to draw a line in the sand and restore confidence. Today, according to the spreads on credit default swaps – which measure the expected probability of default – investors believe a handful of large and medium-sized banks are safe. However, these safe names may appear at risk in the future; this is the lesson from emerging markets, Lehman, and recent speculation around Morgan Stanley and Goldman Sachs. The government needs to have a plan to protect today’s safe banks from self-fulfilling credit panics if necessary. 1. For a limited period, the FDIC could extend its deposit guarantee to all deposits at regulated financial institutions. The full extent of this coverage and how smoothly it works for depositors can be better communicated. 2. The US Treasury should establish a preferred equity injection program for core financial institutions (regulated entities including commercial banks, savings and loans, and credit unions), and present them with two options for meeting capital requirements. First, they can go to private markets. Second, they can access the Treasury window, which is available for only a limited period of time. The Treasury will accept all applications that meet two provisions: after the new issue of preferred shares to the government, the institution would be well capitalized even in stress situations (e.g., a severe recession); and the pricing of this equity injection makes sense for taxpayers as an investment. This would put banks under a great deal of pressure to raise more capital, but whether they do it through shares that are bought by the Treasury or through private markets is up to them. 3. A major fiscal stimulus package is needed to help restore confidence back to the economy, and to encourage businesses not to postpone investment plans. Counter cyclical programs to help consumers always make sense in this kind of situation. We would recommend cash payments and rebates to households and short term investment tax credits to businesses. This is a major way to help both homeowners and renters. Note that implementing a fiscal stimulus package without recapitalizing the financial system would have a much lower chance of success and reduce the fiscal space that may be needed down the road to support the financial system. 4. Housing is a critical component of rebuilding confidence in financial markets. In a credit cycle driven recession, it is easy to imagine that house prices could fall below some longer term measure of fundamental value. Therefore direct measures need to be taken that will break the cycle of foreclosures and fire sales that is now driving down prices. Managing that process will be a major task for the next 2-3 years. Starting this process now may also be essential to the political legitimacy of any decisive approach. The main objection to this approach will come from people who worry a great deal about “moral hazard” in the banking system, meaning that if we bailout banks, this will encourage further risk taking. And if we step in now, in this fashion, they worry that banks will feel in the future that they can engage in even more dangerous risk-taking. Moral hazard is an important potential problem in any financial market. Because people believe that something may be bailed out, the pattern of investment is distorted and the market becomes less efficient. But we are now very far from having an efficient market. At this very moment, investors are asking: who will provide what kind of bailout when the credit crunch hits this or that particular institution? This leads to an extremely inefficient allocation of capital. We need to stop this kind of credit crunch in order to begin moving back in the direction of a more efficient allocation of capital. In a short-term crisis of this nature, moral hazard is not the preeminent concern. But we also agree that, in designing the financial system that emerges from the current situation, we should work from the premise that moral hazard will be important in regulated financial institutions. And we should aim to design, down the road but quite soon, a system with less pervasive and less damaging moral hazard-related problems than the system that now needs to be saved. There is no doubt that Europe is entering a recession alongside the U.S., and Europe’s financial system is suffering severe liquidity shocks due to shaky confidence. There is a clear need to loosen both fiscal and monetary policy across the continent. So far only a few banks have failed in Europe, but more are likely to go down the same road. To date, national governments have put their balance sheets and moral suasion efforts behind financial entities, so creditors have not lost money as banks fell. In the UK, Northern Rock was nationalized, but creditors were made whole. As a result, large European investment and commercial banks have not suffered the same damaging rise in credit default swap rates as U.S. institutions have, and governments have had the time to arrange relatively smooth takeovers when necessary. That said, there are potential fault lines. Some large banks in small countries do not have obvious financial backers and so are susceptible to credit runs. A European-wide approach obviously makes sense, led by the European Union, working with both eurozone and non-eurozone countries. Unfortunately, the general European focus on inflation, drawing on the lessons of the 1970s, is not the appropriate response to the present situation. The determination to fight inflation and keep interest rates high (at the start of potentially its greatest housing collapse since the 1930s, LIBOR rates in the U.K. are near eight-year highs) cannot help trust in credit markets. We believe the U.S. economy, along with many other parts of the world, is entering a recession precipitated by housing markets but primarily caused by an extreme loss of confidence in global credit markets. The withdrawal of credit undermines previously solvent leveraged institutions, causing unnecessary economic damage, and inhibits consumption and investment plans. While the initial housing shock may have generated a moderate decline in growth, the credit shock will have a much larger impact. Once confidence is gone, it is extremely difficult to restore. Creditors need to be confident they can get their money back, but the list of entities where they feel secure is declining at a rapid rate, accelerated by the government reactions to Lehman and AIG. Under these circumstances, almost any leveraged institution can potentially become a dangerous place to put money, as shown by the recent concerns over the previously venerated Morgan Stanley and Goldman Sachs. This is not a case of efficient markets, but a self-fulfilling series of credit panics causing significant economic damage. America’s great strength is its balance sheet. The Paulson Plan uses that balance sheet surgically, attempting to clean up the mortgage-backed securities that triggered the crisis and settle the credit markets through a limited show of force. This may be successful, but it would be a mistake to assume that it will be enough. Policy makers should anticipate the possibility that credit markets will remain blocked and develop a Plan B that uses the balance sheet to draw an impassable line in the sand to stop creditor panics through bank recapitalization based on government acquisition of newly issued preferred stock. At the same time, the damage to the real economy should be combated through a combination of fiscal stimulus and programs to dampen the wave of foreclosures that threatens communities across the country. It seems like a chicken and the egg problem. Potential investors are going to stay away from the banking system until they can accurately value the banks long term assets. Banks can’t write degraded long term assets to reasonable levels to become transparent because in doing so it would throw them into insolvency. Since these assets are in most cases characterized as level 3, illiquid and valued by financial imagineering, they are able to remain on the banks books at values not reflecting the current state of the assets and postpone bank death for another day. Everyone is guessing as to what the real state of our financial enterprises are and the loss of borrowing ability can take down even the players that did everything right. Would bringing additional required disclosure on the nature of the opaque assets be of benefit, and how could these disclosures be made to drive an orderly resolution of the troubled entities? At some point, the walking dead institutions will either have to be recapitalized or cleared. The more order the system can put in this unwinding, the less collateral damage that can be inflicted on the underlying economy. I would agree that while variability in the blind faith of creditors does appear to be more of a problem when they lose faith, perhaps the problem is the need of faith in the first place. Fraud will always be more profitable than honesty and eventually drive it from the market till the market collapses completely. A completely socialized market (as in socialized dog)would be transparent and accountable and would thus not need a leap of faith. The antisocial would always chafe at such collars, but easing them will always result is such calamities. I completely agree that letting the Lehman creditors go was a big turning point. It immediately put unwarranted pressure on money market funds, hightening uncertainty and systemic risk. Have the authorities considered what resources it would take to keep the short term credits sound in all this? That would seem more important, and more effective, than shoring up the mortgage backed securities market. On transparency, I agree that measures that would encourage or force financial institutions to provide more information about their assets would help clear up uncertainties about banks’ balance sheets. Under one theory, the current market panic is causing creditors to underestimate the value of banks’ assets, and transparency would help clear up the situation. Under another theory, transparency would only prove that some financial institutions have been overvaluing the assets on their balance sheets, which would exacerbate the panic, but would have the salutary effect of showing who needs capital and how much. One counterargument is that banks cannot reveal their positions in detail because that will put their trading operations at a disadvantage. Given the currents of opinion, however, I hope we can look forward to greater transparency in the new regulations that are bound to emerge from this crisis at some point. I am not professionally trained and don’t know what this means and what the implications are. It’s not immediately obvious to the average guy why the first way is not desirable, especially since the emerging markets could do it. I apologize for the use of jargon pointed out above. Financial institutions take money in and lend it out. A large proportion of the money they take in is in the form of short-term loans. There are many types of short-term funding that I won’t get into, but their common characteristic is that you have to pay them back relatively quickly. So while the mortgage you lent out to someone is paid back over 30 years, you may have to pay back some of your short-term funding in 30 days. Usually that’s not a problem because you can “roll it over” – instead of paying it back, you just arrange with your creditor to extend the loan another 30 days. The problem today is that creditors are reluctant to extend those loans, so banks have to find new lenders … and that’s not easy. “Asset quality” is the value of the loans you have made, like mortgages, credit card debts (the amount that your credit card customers owe you), and so on. Ordinarily if your assets are of high quality, people will lend you short-term money. But again, the problem today is that creditors don’t want to extend short-term credit or provide new short-term credit, even if the borrower has healthy assets. As for the first way of ending a crisis of confidence, the problem is that it can have a damaging effect on the real economy, because all sorts of real companies (not just banks) need credit to survive. I know that the people in charge have not explained this well (there has been a lot of “trust me”). I recommend the posts on this site tagged “real economy,” where I try to give a couple examples of how the credit crunch bleeds into the real economy quite quickly. This entry was posted in Baseline and tagged Global Crisis. Bookmark the permalink. It strikes me that while we need to shore up the financial markets, the way to do it is not by buying MBS. It is by relentlessly re-negotiating the mortgages themselves. Instead of a 700B bailout to buy the bad “insurance plans” that the banks were trading like baseball cards, we should be addressing the mortgages directly. How about a plan that re-structures Mortgages for primary residences only, forces banks to restructure the mortgages, make those people that bought more house than they can afford rent out a room, or sell part of their house back in a reverse mortgage, or other mechanisms. I think we need some regulation. If nothing else, Bush has put more power into fewer peoples hands throughout his time in office, and it has always been bad. His push to put 700B in Paulson’s control is just another way to de-democratize our government, take away the checks-and-balances that our constitution designed in, and create a class of royalty in the US. These were roughly my immediate sentiments when I first heard about the bailout package and read the now-infamous 3-page legislative proposal. Since then, however, I think that the plan made significant improvements, primarily in the area of oversight; the extent of oversight that they eventually agreed to is perhaps a sign of how important Paulson and Bernanke believed this was for the economy. I do agree that there needs to be a solution for homeowners that restructures mortgages in a way that benefits both homeowners and lenders, or at the very least cushions the impact of foreclosures, for example by requiring rental periods to minimize short-term dislocation and slow down housing price declines. The language in the final plan on this score was pretty vague. This is one reason why the government’s work will not be done, even if the plan does pass this week. I watched Simon this morning’s discussion put on by the Brookings Institution. Very good questions were asked. One that I have is why interbank lending is so important when the Federal Reserve is supposedly the “lender of last resort”. In the current crisis, why cannot the Fed increase liquidity in the financial markets and quench the credit thirst? Certainly this would lead to inflation, but I submit this consequence would be less severe than the current bailout plan. The Fed could lend money to those banks and thrifts that establish they are not unduly exposed to sub-prime mortgages (e.g. those who have made good fiscal decisions). Or how about temporarily reducing the reserve rate to prevent banks from going into regulatory insolvency? Then gradually increasing the statutory reserve rate over time. Although I am a lay person when it comes to these matters, I find myself proposing rather simple solutions as I learn more about the industry. Why is the most accepted solution so complex? I find it very hard to believe that simplifying the system would not fix the problem. I fear that too many people have become indoctrinated into a complex system that does not need to be so complex (economists, bankers, and politicians alike). Am I way off the mark? How? P.S. I noticed a grammatical error in your Baseline Scenario, on page 5 third to last paragraph, last line, “Many others are POURING over…” should be PORING. First, thank you for catching the misspelling. Our policymakers should be open to all kinds of suggestions, like the ones you raise. Whether the Fed already has sufficient powers to combat the bailout is an important question. The Fed has been pumping more and more money into the banking system in order to keep the Federal funds rate low, and has allowed financial institutions to borrow against a wider and wider range of collateral. To date, though, it has been insufficient to calm the panic that has locked up the credit markets. I think – and this is just my guess – that Paulson and Bernanke decided that actually buying the troubled assets, rather than just lending against them, would provide a more definitive solution and thereby instill the confidence that was previously lacking.